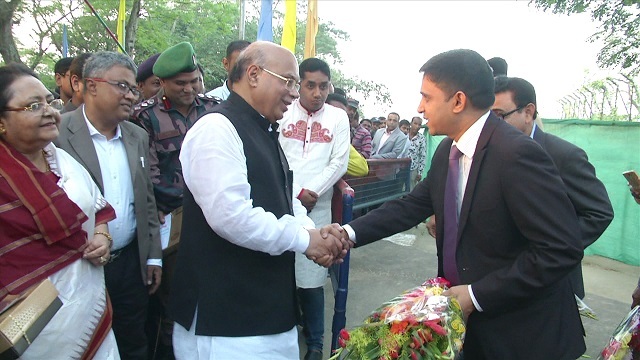 Relationship between India and Bangladesh at present is all time best, said health and family welfare minister of Bangladesh Mohammed Nasim who reached here on Friday evening to take part in the ‘Vijay Divas’ (Victory Day) programme at Agartala. He was speaking to Indian and Bangladeshi reporters at the zero point of Akhaura integrated check post in the Tripura-Bangladesh border. He further said it gives great happiness to him for being in India and especially Tripura on the eve of Vijay Divas and at present a natural relation has been created between the Indian and Bangladeshi population and which will further strengthen with every passing day. Altogether 93,000 Pakistani troops and officers surrendered to the joint command of Indian army and Mukti Bahini on that day.